Metairie, Louisiana (December 14, 2011) – Clearview Mall, managed and leased by Stirling Properties, raised $630 for the Children’s Hospital of New Orleans with their Breakfast with Santa held Saturday December 10, 2011. Clearview Mall partnered with Zea Rotisserie and Grill to provide a private breakfast for approximately 135 children and their parents to celebrate the holidays. Along with a plated breakfast there was face painting, games, storytelling and a visit from Santa and Mrs. Claus. Giveaways included Christmas decorated candied apples from Rocky Mountain Chocolate Factory for the kids and glass mugs titled “Breakfast with Santa Clearview Mall 2011,” engraved by Cupid’s Engravings, for the parents. “Clearview Mall has a history of giving back to the community so being able to support the efforts of the Children’s Hospital, while hosting a holiday breakfast for our younger patrons, was a great way for us to connect with those who need help this holiday,” said Christie Naccari, Special Events and Leasing Coordinator for Clearview Mall. 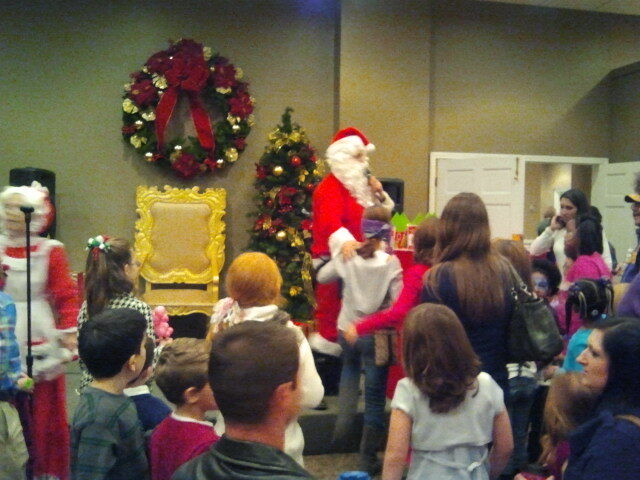 “The event was a success and we look forward to hosting more events like Breakfast with Santa in the future”. For information about events planned for Clearview Mall contact Christie Naccari at (504) 885-0202 or by email at cnaccari@clearviewmall.com. Extended holiday shopping hours can be found by visiting www.clearviewmall.com or by calling (504) 455-7289.